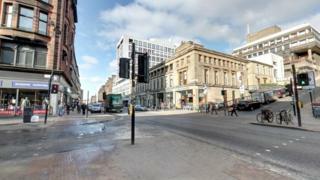 A man was stabbed in the leg after fighting broke out between two groups of people in the centre of Glasgow. The disturbance happened outside a takeaway shop in Sauchiehall Street, at Pitt Street, at about 01:15 on Sunday. Fighting broke out after seven men approached a group of four men and two women. Police said several people were assaulted and a 39-year-old man who was outside the takeaway, but not part of either group, suffered a leg injury. The incident was not reported to police and those involved left the area. Officers are checking CCTV footage but are still appealing for witnesses to come forward. Details about the groups is limited but one female had blonde hair, and was wearing a black crop top, white skirt and knee-length socks. Det Con Mark Paterson said: "A man who had nothing to do with this incident has ended up being stabbed in the leg. "Sauchiehall Street is a busy street with many revellers on nights out." He added: "I am asking anyone who was in the area around the time of this incident to contact us. "They could have information which could prove vital in helping us trace the members of both groups. "It's possible people thought the incident wasn't so serious, but an innocent bystander has been attacked by someone intent on causing harm, even though he had nothing to do with either group or the trouble that flared up between them."